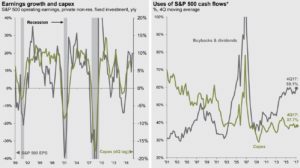 One hallmark of current recovery and business cycle has been the lack of investment spending and instead a focus on dividends and stock buybacks by U.S. corporations. Why would a company choose to return capital to shareholders though dividends and buyback rather than investing back in to the business to create long-term value? Charts her show that in 1990’s corporations preferred to spend profits on CapEx and now they prefer payouts to shareholders. The difference may have to do with the expected low demands. On the other hand new lower CapEx tax rates may push it higher.